There is only a couple of weeks until Valentine’s Day, do you know what you will be gifting? We have a really cute idea to share with you that won’t take much effort at all. All you will need is a few basics and the free printable Valentine’s Day Tags below to create a clever little craft that your friends or your children’s friends will smile about. We used Peeps Hearts for the sample craft, but you can use any candy that you would like. Using a heart shaped candy will drive the point home nicely though. Each tags says “Valentine, I have the hearts for you”. There is a place for you to write who the gift is to and who it is from on the back. So get your printer fired up because we’ve done most of the work for you. The little project is a cinch to put together. 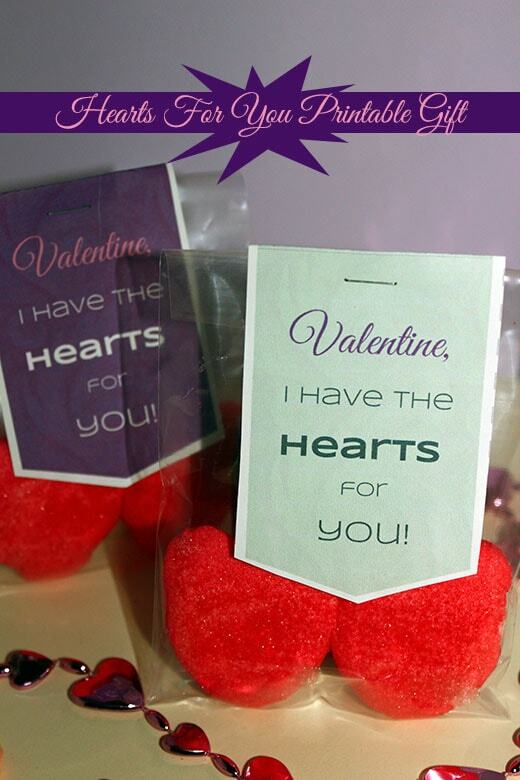 You’ll just need to print the free V-day tags and get some treat bags, your candy of choice and a stapler (or tape) to make these fun little gift bags. Print off the number of gift tags that you’ll need (4 per page). Cut each tag out by following along the grey dotted lines. Fold each individual tag in half exactly. Fill your treat bags with the candy you chose Finally, seal it together with either a stapler or tape. Aha, that’s it! In just a few minutes you’ll have a a really great mostly made by you gift that will make your friends smile. Visit Just Married with Coupons for more Printable Crafts for Valentine’s Day. I love Valentine’s Day and I LOVE peeps! What a great combination, thanks for sharing your craft! Neat idea! I love Vday crafts. Thank you for sharing these! I always have a hard time finding free cute printables. I’ll definitely have to make these! Handmade Valentines are the best. This will be great for Valentine’s Day! passing this on to my brother who has about a dozen grand-kids…I see an arts and crafts day ahead for them thanks! What a simple and cute craft for valentines day. Love the printable.